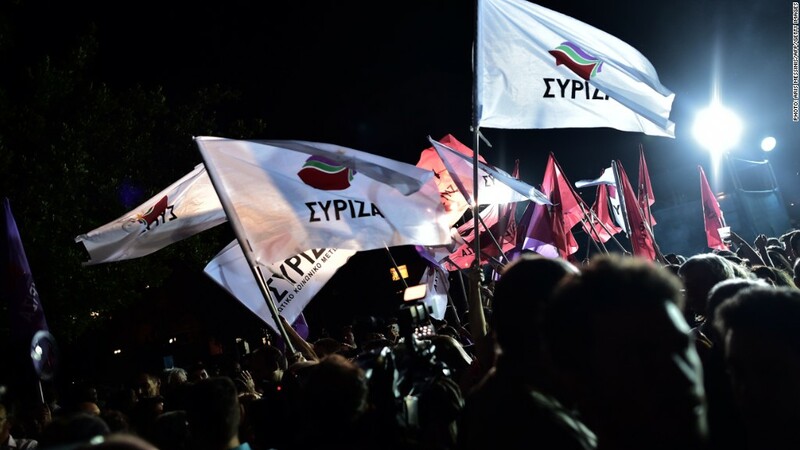 Polls show the anti-austerity party Syriza could win the most voter support during upcoming elections in Greece. Greece's parliament will be dissolved and the country will hold snap elections within the next month, risking a nasty fallout for Greece's fragile economic recovery. The need for snap elections was triggered Monday after Greece's parliament was unable to secure enough votes to install a new president. The main Greek stock market index plunged by as much as 11% after the voting results came out, but then recovered slightly. The main indexes in Spain and Italy also dipped by about 2%. The yield on Greek 10-year government bonds jumped by one percentage point to 9.3%, reflecting growing concern that Greece may be heading for another debt crisis. Opinion polls indicate the popular anti-austerity party -- Syriza -- could win the most voter support at the upcoming elections. This is a party that wants to renegotiate the terms of Greece's 240 billion euro ($293 billion) bailout package with the International Monetary Fund, European Commission and European Central Bank. However, Syriza has been softening its tone recently and says it wants to stay in the eurozone. Despite the risks presented by the current situation in Greece, experts think the eurozone is now better placed to cope with another Greek crisis. "The eurozone could probably handle an unlikely but not impossible Greek accident with no more than very limited and temporary damage," said Berenberg economist Holger Schmieding in a research note written earlier this month. James Shugg, a senior economist at Westpac in London, echoed this sentiment. European leaders are much better prepared to deal with a potential Greek fallout, said Shugg. "This is not the beginning of [another] euro sovereign debt crisis," he said. The upcoming Greek elections are expected to be held on January 25.